AO-27 is an amateur satellite constructed by the Amateur Radio Research and Development Corporation (AMRAD) at the facilities of Interferometrics in McLean, Virginia. It was originally designed as a commercial satellite known as EYESAT-1 but its completion was halted part way through the project. 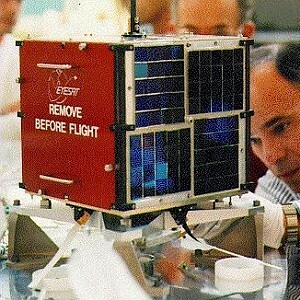 An agreement was made for AMRAD to finish the construction of the satellite and add an amateur satellite transponder. AO-27 is an “FM Repeater” in space. It essentially consists of a crystal controlled FM receiver operation at 145.850 MHz and a crystal controlled FM transmitter operating at approximately 436.795 MHz. Output power of the transmitter can be set to over 1 watt (rarely used), 0.5 watts (normal operation), or under 0.1 watts (exciter only). The uplink antenna is the linear polarized whip on the top face of the spacecraft and is shared with the commercial payload’s receivers. The downlink antenna is a 1/4 wave whip mounted on the bottom face of the spacecraft. Polarization is nominally linear, the rotation and revolution of the spacecraft and propagation effects will cause the actual signal polarization at a ground station to vary widely during a pass. Decoding is possible with a 1200 bps AFSK (packet) modem in kiss mode. The kiss output can be used as input to for example the AMRAD AO-27 decoder from DK3WN. the RX telemetry was disabled right before launch. Inactive, FM repeater – Telemetry transfer over Italy. Don’t transmit unless you hear the FM repeater functioning.